At last Thursday’s L.A. City Planning Commission Meeting, Commissioner William Roschen argued for exemptions from a proposed moratorium on any new billboards without disclosing that one of his architectural firm’s projects could be a beneficiary of those exemptions. 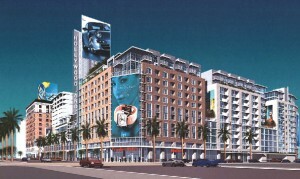 Roschen’s firm lists in its portfolio of projects a large mixed-use development that recently began construction at Hollywood Blvd. and Vine St. in Hollywood. That development includes a hotel, condominiums, and retail space, as well as more than 20,000 square ft. of supergraphic advertising signs and rooftop billboards. Planning Commission chairwoman Jane Usher and a representative of the city attorney’s office both argued against exempting any signs from the moratorium that hadn’t received actual building permits from the city. 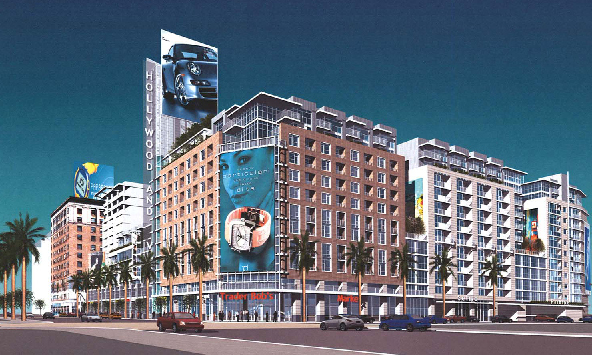 The signs in the Hollywood development haven’t been issued permits, according to records of the city’s department of building and safety, even though the overall project has been approved by the city. Assistant City Attorney Jeri Burge argued that allowing exemptions to the moratorium for any signs that hadn’t received permits could seriously undermine the city’s ability to defend the moratorium in court. And Usher cited recent court decisions holding that the city’s granting of numerous exceptions to sign laws had compromised its ability to enforce those laws. Nevertheless, Roschen argued that if certain developments including billboards and supergraphic signs had been approved by the city, those signs should be exempt from the moratorium. He was supported by Commissioners Regina Freer and Robin Hughes, and the commission eventually voted to keep the exemptions in the moratorium. The commission also voted to reduce the term of the proposed moratorium from one year to six months, even though city planners testified that it would be extremely difficult to get meaningful public input on new sign regulations in such a short period of time. To listen to audio of the meeting, go to the City Planning Department website, click on “meetings and hearings”, then “city planning commission”. To read a City Ethics Commission directive on conflicts of Interest by public officials, go here.